One Mom's Moxie: Stim-U-Dent - It's Time to Toss the Floss! Last month I received a product to review that is similar to floss, but so much better. I received Stim-U-Dent Plaque Removers made by The Natural Dentist. They are able to clean in between teeth much better because they are triangular shaped, so they can reach some places that floss cannot. I was impressed by how clean my teeth felt as well as feeling fresh. The pack I received were original which is a mint flavor. The mint is not too strong, it's just right. Each package comes with four smaller packs of 25 plaque removers. The packs are about the size of a matchbook, so small and convenient to carry around. I tucked one in my purse and one in my car. I also keep the other two packs at home, I am running low so it's almost time to get more. Honestly I didn't think I was going to like Stim-U-Dent plaque removers but I love them! 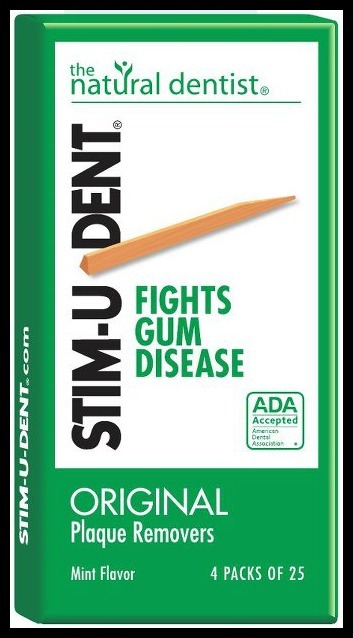 You can follow The Natural Dentist on Facebook to keep up on Stim-U-Dent and all their other awesome products.